on the Dive Bus trips. No cattle boats, no crowds, no stress. Return time between 2 - 4pm, depending where we're diving. Or follow the Bus in your rental car, stay as long as you like. Your first day of diving is on The Dive Bus reef. 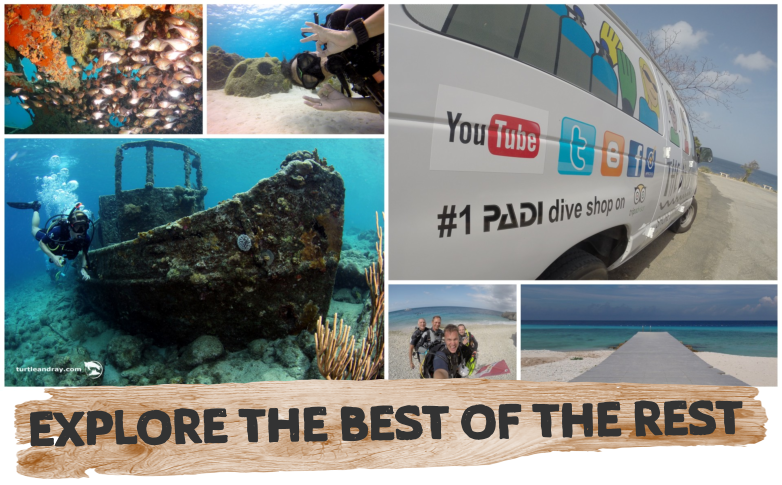 After that, come join us on the Dive Bus trips and explore the best of the rest of Curacao's shore diving. Think of the Dive Bus as a dive boat - without the sea sickness, crowds, short dive times, bouncy, cramped surface intervals and short dive times. 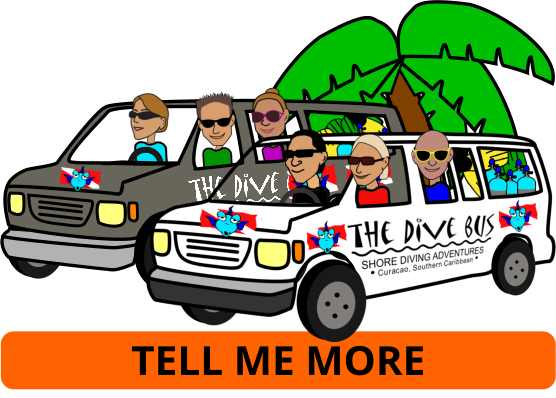 Meet at The Dive Bus shop or we'll pick you up and head out on a 2 tank shore dive trip. All our dive sites are special for one reason or another. We pick those we think are best / you'll enjoy the most, rather than have a fixed weekly schedule, and make both dives from the same beach (different profiles /directions) so we can set up and chill out for the day, without the hassle of lugging wet, sandy gear from place to place. Your non-diving buddies and family are welcome to join you. Whilst you're off meeting the fish, they can put in some valuable work on their suntans, or snorkel, wander, climb and explore Curacao's coastline. There's no guide provided for snorkelers, so buddy pairs are recommended for exploring the fish and coral. There are snacks for your surface interval on the beach, and a simple help-yourself-picnic lunch after your 2nd dive. That's also when the beer cooler's opened (there's nothing like a good, cold beer on the beach after some great diving...!) Relax and swop fishy tales whilst we pack up and head back. There's no need to ask us to take you to the best dive sites. It's what we do. Instead of a fixed dive-site schedule, we choose sites we think you'll enjoy the most, or take requests for 'cool spots' (turtles, nudibranches, mermaids, whatever). You'll be fully briefed on the safety procedures including the secret spot for the phone, O2 kit, medical kit, dive spares, emergency cash, Emergency Action Plan etc etc. Because many of the dive sites are remote, leave your valuables and anything that you won't need for your dives, back at the dive shop. As part of our Eco Policy, we aim to leave every dive site cleaner than when we arrived. Help by putting all trash into our 'bin', to take back to the Dive Bus shop, so we can recycle plastics and aluminum, and ensure the rest goes into the 'system' not the ocean. We built the Dive Bus Safety + Eco Policies so everyone can enjoy awesome, fun, safe diving - without damaging what you're here to see. No worries. This is the PERFECT time and the PERFECT place to try it out on a PADI Discover Scuba Dive. No experience necessary. Been 18 months or more since you dived? No worries. This is the PERFECT time and the PERFECT place to refresh your skills, knowledge and confidence AND enjoy a beautiful dive. Buy it. Because you know it works for you.